You might wonder what mindfulness has to do with making mistakes at tennis. If you learn to effectively manage making mistakes at tennis you can achieve two important mindfulness skills, (1) accepting what is and (2) reducing negative self-evaluation. Tomaz Mencinger, Slovenian tennis coach, reminds us that no one has zero tennis mistakes, no matter what their level. If you watched world no.3, Roger Federer, play 20 year old, Greek tennis player, Stefanos Tsitsipas, at the 2019 Australian Open, you will have noticed how many mistakes Federer made, even on his trusty backhand – a total of 55 unforced errors. This level of errors occurred even though there were only a few points difference influencing the final result – Stefanos Tsitsipas won 6-7, 7-6, 7-5, 7-6. The reality is that tennis is such a complex game for mind and body that it is inevitable that you will make mistakes – everyone does, no matter what their level of competence and mental capacity. 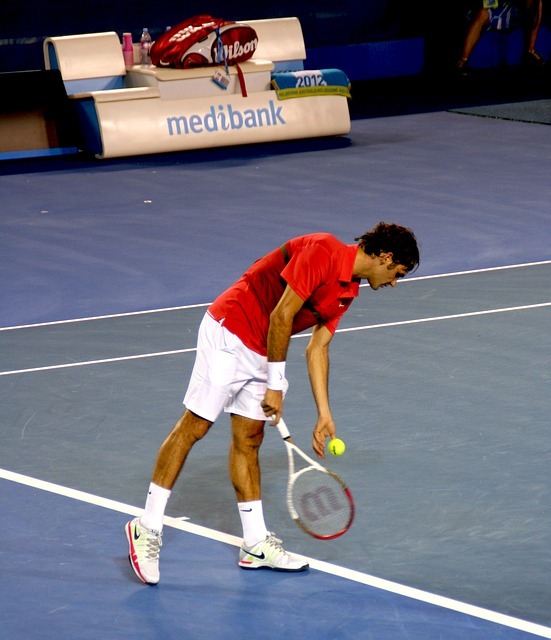 Tomaz reminds us, in his landmark article on making mistakes in tennis, that a part of the brain, the cerebellum, controls our movement, coordination of muscle activity and our balance at any point. The cerebellum is taught over time through our training and activity how to assess what kind of bodily response is needed to respond to the challenge of a tennis shot from an opposing player. As Tomaz points out in his profile story, hand-eye-coordination, for instance, can be developed through various sports and utilised by our brains to direct our bodily response in tennis. When you think about what is required to hit a tennis shot in response to a shot from another player, you can begin to realise how complex the response mechanism is and how easy it is to make a mistake in tennis. For starters, the brain must register the speed, spin and likely trajectory of the opponent’s shot (data taken from observing the force applied, the angle of the racquet, positioning of the body, experience of the opponent’s shot-making, how the shot is being disguised and the overall game strategy of the opponent). Your brain then has to direct your physical response – which is limited by your awareness, physical capacity, energy level, skill and prior experience. On top of this, as Roger Federer found in his match against Tsitsipas, a changing environment can impact the effectiveness of your shot-making (e.g. if the balls are heavier because of the night atmosphere or from closure of the roof over the tennis court). You might think that as you improve through coaching and training, you will be free of mistakes in tennis. Tomaz argues that this is an impossible ask – you will continue to make mistakes no matter how proficient you become at shot-making. Part of the explanation for this is that as you become more competent, you take more risks and try to make more difficult shots, e.g. attempting to create greater angle, slice, depth and/or speed with your volley. So, we are programmed to make mistakes, even though we can play better shots more consistently with practice and coaching. Tomaz maintains that our percentage of errors over shots remains relatively the same over time, even as we improve our proficiency in playing tennis. Of course, as you age, you lose some of your capacity – your eyesight declines, your reflexes slow, your mobility reduces and your muscle power declines (even when you undertake exercises to reduce the rate of decline). All these declining physical features impact both what your mind sees and interprets and how well your body can respond to the messages from your cerebellum. So, as you age, you not only need to accept making mistakes but that the rate of mistakes will more likely increase owing to declining mental and bodily facilities. Tara Brach reminds us that a “willingness to be with what is” represents a core component of mindfulness along with internal and external awareness and open curiosity. Accepting that you will make mistakes in tennis is a good discipline for developing the mindset of accepting “what is”. This does not mean that you do not try to improve your technique, fitness, and balance – your ongoing enjoyment of the game will depend on observable improvements that you can make, e.g. better speed and/or placement of your serve, more effective and penetrating volleys or more consistent backhand shots. You could also focus on improving mental resilience as the inner game of tennis is as important as its external manifestation. What goes on in your mind during a tennis game can dramatically affect the outcome and your level of enjoyment. Learning to deal with negative self-evaluation after a mistake is a key element of this positive mental state. I have written a lot about negative self-evaluation and the positive impact that mindfulness can have on redressing the negative outcomes of such evaluations. Tennis with its mistake-prone nature provides a great opportunity for us to practise overcoming our negative self-evaluations and be more mindful of the enjoyment of playing tennis and interacting with others. A starting point is to develop self-awareness around your own response to making mistakes. Do you frown, pout, scowl, hit a shot in anger, swear, psychologically withdraw or bounce your racquet. These are external manifestations of a state of frustration at making mistakes in tennis. They reflect an unrealistic expectation that you can be mistake-free in tennis – no one can! So, a key aspect of self-regulation and associated mindfulness, is to adjust your expectations of yourself when playing tennis. Typically, we will engage in negative self-evaluation when we make a mistake – “What a silly thing to do”; “How could I possibly miss such a simple shot?”; “People will think I can’t play tennis”; “How stupid am I”; or “I’m letting my partner down”. We will blame the mistake on the fact that we did not bend our knees far enough, took our eyes off the ball, lost concentration, misjudged the speed of the ball, and many other defects in our game. The problem with negative self-evaluation is that it does not improve our game but leads to lower self-esteem and loss of confidence – all of which, in turn, negatively impacts our tennis game and increases the likelihood of errors. Jon Kabat-Zinn reminds us that mindfulness entails being in the present moment non-judgmentally. If we learn to manage our negative self-evaluation when making mistakes in tennis, we can develop mindfulness – awareness in, and of, the moment, without resorting to negative self-judgment. As we grow in mindfulness through meditation and by effectively managing making mistakes in tennis, we can have a more productive game, interact more positively with others and really enjoy the experience of being able to play tennis. Effective management of mistake-making in tennis involves accepting that mistakes will happen and avoiding negative self-evaluations as a result.